MJ Rosenberg, Senior Foreign Policy Fellow at the Media Matters Action Network and a regular contributor at the Huffington Post, until recently routinely labeled those he found insufficiently critical of Israel as “Israel firsters” – see for example his article Why the Term “Israel First” Matters. For this he was roundly criticized (notably here and here), since the term “Israel firster” is usually associated with neo-Nazis like Willis Carto, founder of the anti-Semitic Liberty Lobby, and with others who accuse Jewish supporters of Israel with holding “dual loyalty” – that is, being disloyal to the United States. Rosenberg was then apparently rescued from such criticism by Philip Weiss, proprietor of the virulently anti-Israel blog Mondoweiss, who discovered that the term was employed long ago by none other than Abram Sachar, the noted historian and founding president of Brandeis University. Sachar was speaking to the JWB, or Jewish Welfare Board, which bought Torahs for Jewish boys in uniform. American uniform. And he made his comments in the context of American Jews being loyal citizens of the U.S. Ben-Gurion, the first prime minister of Israel, had long urged American Jews to move to Israel. The American Jewish community was resisting the pressure to make “greater commitments” to Israel. 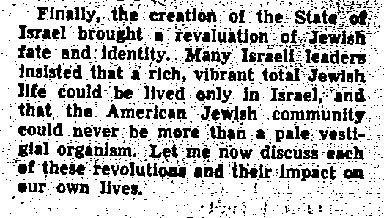 Note that Sachar is clearly refering to Israelis: “the desperate need for American immigration” and “such sentiments are not really a core feeling on the part of knowledgeable Israelis.” In other words, Weiss’s claim that Sachar made “his comments in the context of American Jews being loyal citizens of the U.S.” could not be more wrong. While the term “Israel firster” is not in the Times report, the point is clear: to Sachar, “Israel firsters” were Israelis, not Americans. That is, Sachar’s use of the term has absolutely nothing to do with any implied or explicit “dual loyalty,” and is not related in any way to how Willis Carto, MJ Rosenberg, Philip Weiss et. al. use the term. Sachar thus offers no solace whatsoever to those who use “Israel firster,” which is as odious as ever. Of course, Weiss might argue (despite his own use of secondary and tertiary sources) that the Times report is after all, a secondary source, and one ought to appeal to Sachar’s actual speech to conclusively determine the context in which he used the term. .. the dogma assumes that the richness of the Jewish heritage cannot be experienced except while in the affirmative, all-embracing nationalist climate of awakened, resurgent Israel. In my own travels in Israel, and in the travels of many friends who love Israel, we have usually been quickly put on the defensive to justify our continued identification with American life. An Israeli entourage that recently visited our campus was scornful about the “narishkeit” of universities and similar institutions built by Jews in the shifting sands of a temporary nacht-asyl. … American Jews … are proud of their self-reliance. They do not equate Jewish vitality with persecution. They have learned the lesson of history which relates creativity to freedom and abundance, that respects the climactic miracle of Israel. 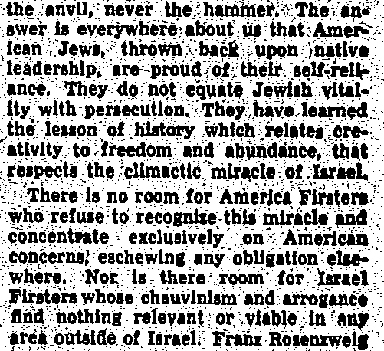 That is, in Sachar’s usage in this speech, America Firsters are not Charles Lindbergh-like apologists for Nazi Germany, they are Americans who deny the importance to Jewish life of Israel, and Israel Firsters are Israelis who deny the importance to Jewish life of the American Jewish community. 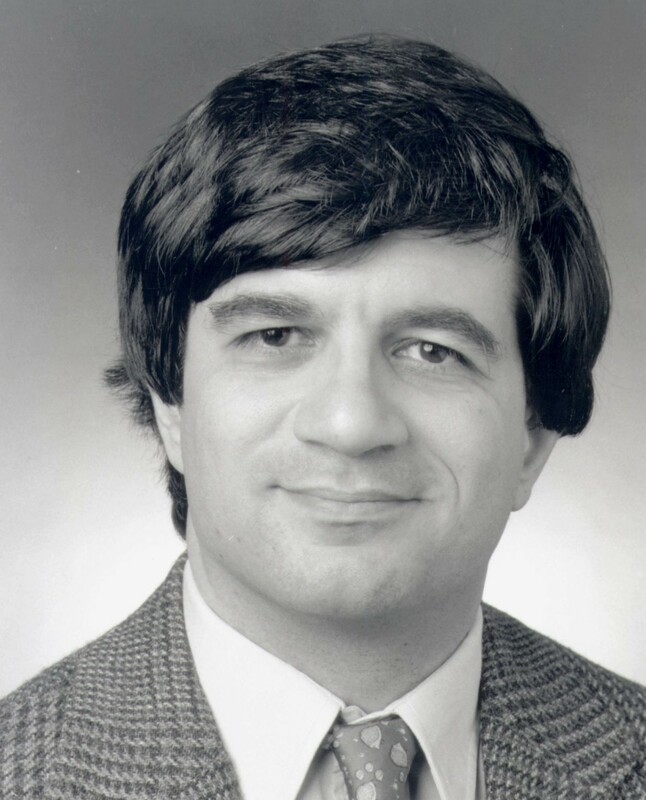 With his claims now exposed as nonsense, will Philip Weiss issue a forthright correction in his blog? And Rosenberg, who announced he would stop using the term “Israel firster” not because it was wrong but because it was becoming a “distraction,”continues to cite Sachar’s speech as a defense. With the cover of Sachar now removed, will he finally concede that his usage was indeed indefensible and wrong?